ConocoPhillips Dividend History: Can the Energy Giant Bounce Back? After a long period of dividend growth, the oil company had a big setback last year. The energy industry has gone through huge upheaval over the past couple of years, with oil prices plunging from triple-digit levels to go below the $30 per barrel mark in early 2016 before recovering somewhat. Before then, ConocoPhillips (NYSE:COP) had seen tremendous growth, spinning off its refinery operations into Phillips 66 (NYSE:PSX) and producing solid dividend yields for its shareholders. Yet more recently, like many other major oil companies, ConocoPhillips has felt the pain of falling prices for crude oil and natural gas, and dividend investors took a big hit when the company decided to reduce its payout to reflect tough industry conditions. Now, ConocoPhillips shareholders are trying to figure out whether a return to dividend growth might come soon. Below, we'll take a closer look at ConocoPhillips' dividend history. 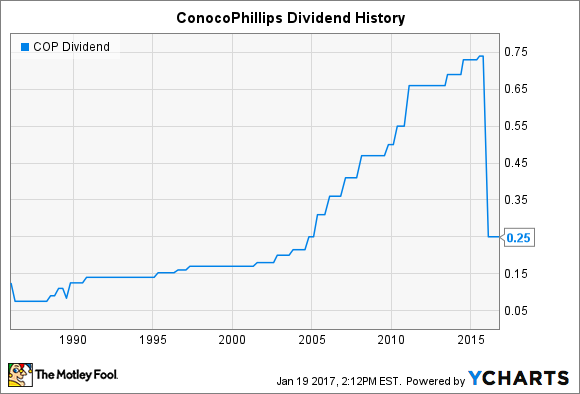 ConocoPhillips paid out its first dividend in early 1982 immediately following its initial public offering, and since then, the company has done a good job of paying dividends to its shareholders. Ups and downs in the oil market in the 1980s led to corresponding fluctuations in both directions in the energy giant's dividend payments, but over the long haul, ConocoPhillips boosted its overall dividend dramatically. In particular, the period since 2001 has been a time of extremely fast dividend growth for ConocoPhillips, which happens to correspond to when Conoco and Phillips merged. The company gave investors 15 dividend increases between 2001 and 2015, riding the wave higher in crude prices during the mid-2000s and yet weathering the storm of the 2008 financial crisis successfully. Between 2001 and 2012, the company quadrupled its dividend payment, leading up to the 2012 spinoff of its midstream and refinery operations into Phillips 66. The spinoff left ConocoPhillips to focus entirely on upstream exploration and production efforts. Even after the spinoff, ConocoPhillips kept giving investors dividend increases, but they came at a slower pace. In 2013, investors got a 5% raise, which was somewhat of a disappointment after several double-digit percentage increases in previous years. Further gains slowed to just a $0.01 per share increase in 2015, giving an early warning of the price problems that ConocoPhillips was facing in the energy markets. Nevertheless, going into 2016, few expected a dividend cut, in large part because ConocoPhillips executives had expressed the company's commitment to sustaining its dividend despite ongoing business challenges. On several occasions, CEO Ryan Lance and his team had said that the dividend was a top priority and that it would only go up, not down. Nevertheless, that didn't stop ConocoPhillips from doing an about-face and cutting its dividend by nearly two-thirds in February 2016, reducing quarterly payments from $0.74 per share to $0.25. In explaining the decision, Lance pointed to the plunge in oil prices that continued into the beginning of 2016, saying that "we believe it's prudent to plan for lower prices for a longer period of time." That decision came at the same time that ConocoPhillips announced it would leave production flat in 2016, ramping down from expectations for 1% to 3% growth as the company decided to slash its capital expenditure budget by $1.3 billion, or about a sixth of its previous guidance. Will ConocoPhillips raise its dividend this year? Looking forward, ConocoPhillips has expressed its intent to start growing its dividend again. At its investor day in November, Lance noted that "our intention is not to get back as fast as we can to the $3.7 billion worth of dividend payments that we had last year." But he did say that even with prices in the $50 per barrel range -- which is where they are now -- ConocoPhillips would be able to deal with dueling priorities that include reducing debt, maintaining production, and finding ways to grow its dividend. In addition, the company wants to make stock repurchases to return capital to shareholders as well. At this point, it's too early to tell what ConocoPhillips' future dividend history will look like. When it releases its annual report in early February, ConocoPhillips investors should have a much better idea of what to expect on the dividend front.